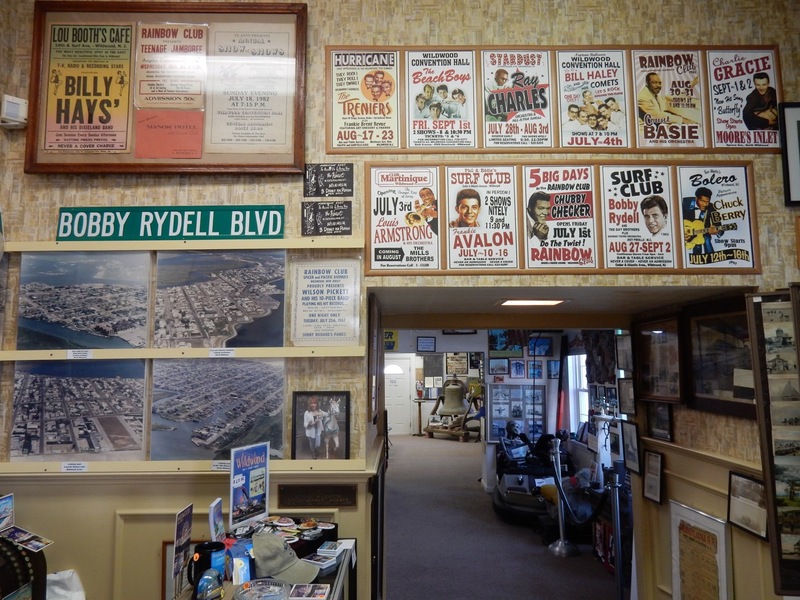 In the 50’s and 60’s, “all the greats” played at nightclubs called The Hurricane, Rainbow, Beachcomber, Riptides, Surf Club, the Starlight Ballroom, and a multitude of others. But, in 1979, Resorts International opened in Atlantic City 40 miles to the north, leading to a casino growth spurt that attracted headliners, and by the ‘80’s Wildwood fell into decline. If you had visited then, when misbehavior and seediness prevailed, and haven’t returned since – come back! You will be amazed. 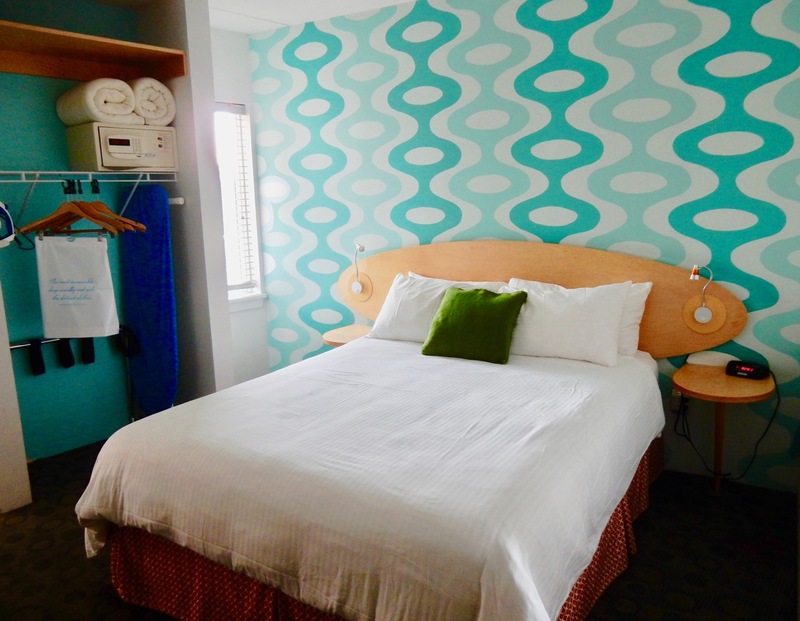 Over the last 15 years, Wildwood has made a triumphant return, regaining its retro family friendly reputation and taking full ownership of, yes, its tacky “Alt-Deco” motels that have since been elevated from dump to adorable. 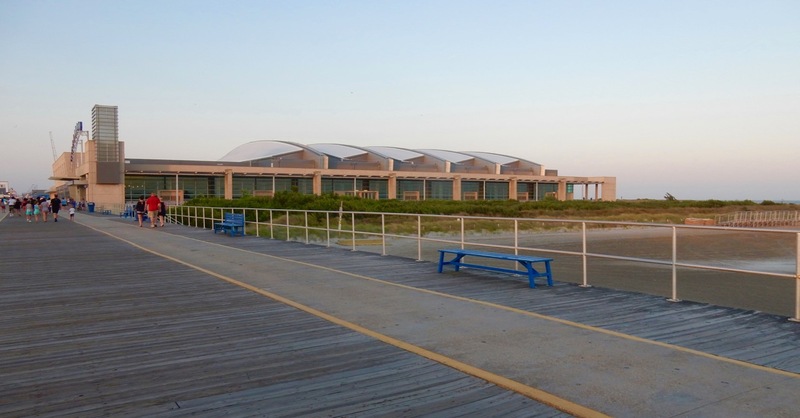 The massive Wildwoods Convention Center, built in 2003, has been a “game changer” for the economy, turning the town into a year round destination. Now, nearly nine million people a year come to this Jersey Shore island, known as both the “Plastic Palm Tree Capital of the World” and the “Doo Wop Capital of the World.” It’s high time you returned to walk the historic Boardwalk, scream on Morey Piers’ roller coasters, dodge the Tram Cars, take the Neon Lights Night Tour, and stay in a newly renovated “Doo Wop” hotel. Kitsch has never been so cool. WALK: The Boardwalk. 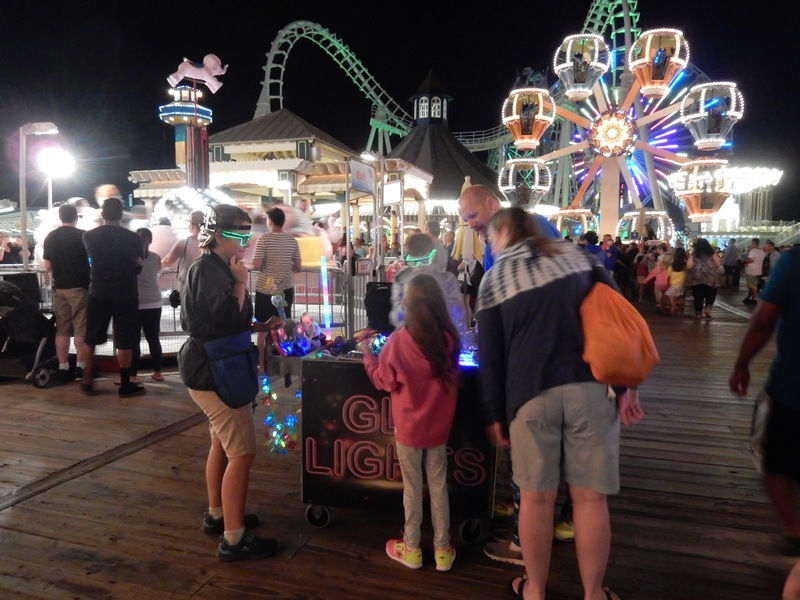 The 2.5-mile boardwalk is sensory overload at all hours, but particularly at night, when the multitudes consume greasy fast food, and lights and sounds from boardwalk shops and Morey’s Amusement Park rides fill the air. In the morning, the old boards bear the weight of thousands of cyclists and Fitbit walkers who parade and roll on every inch of timber and cement. RIDE: Wildwood Sightseer Tram Car on Wildwood Boardwalk. 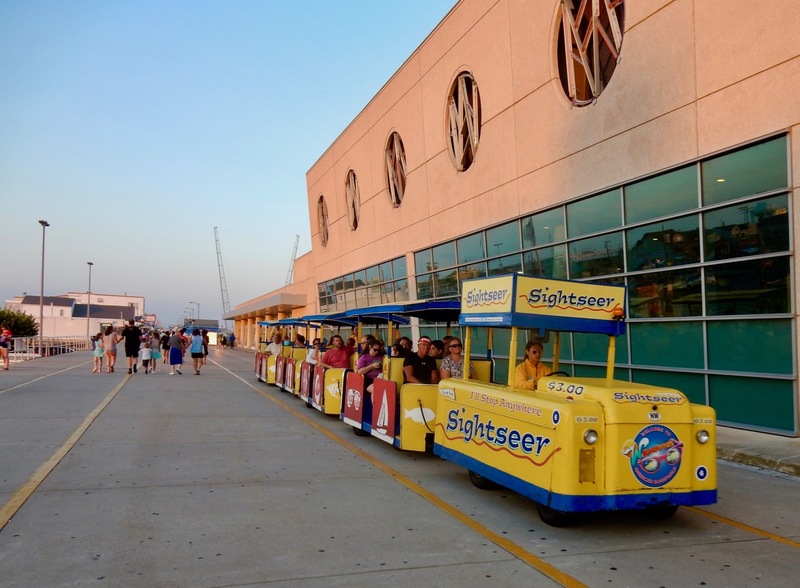 The excessive repetition of the recorded “Watch the tram car, please,” is so ingrained in Wildwood’s lore, the phrase is stamped on t-shirts and souvenirs. 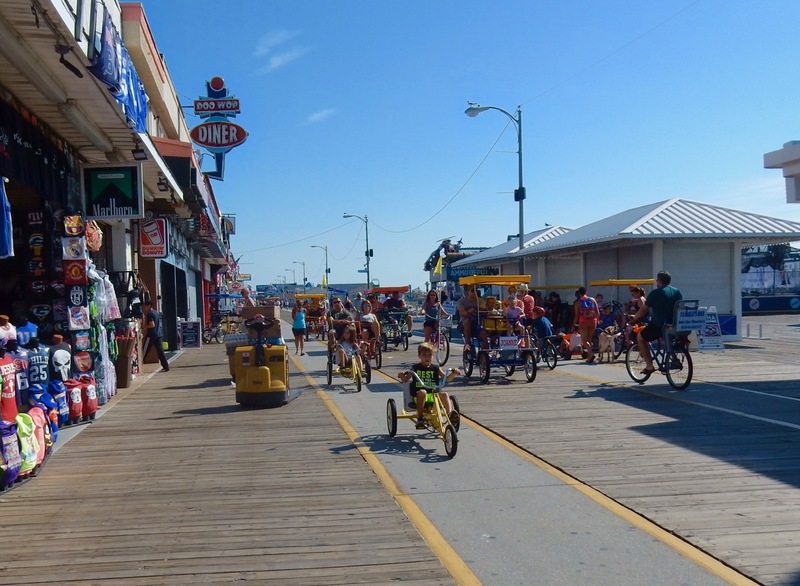 Built for the 1939 New York World’s Fair, these 8 eco-friendly trams have been running the full length of the boardwalk since 1949 and are considered the oldest continuously operating electric boardwalk vehicles in the world. 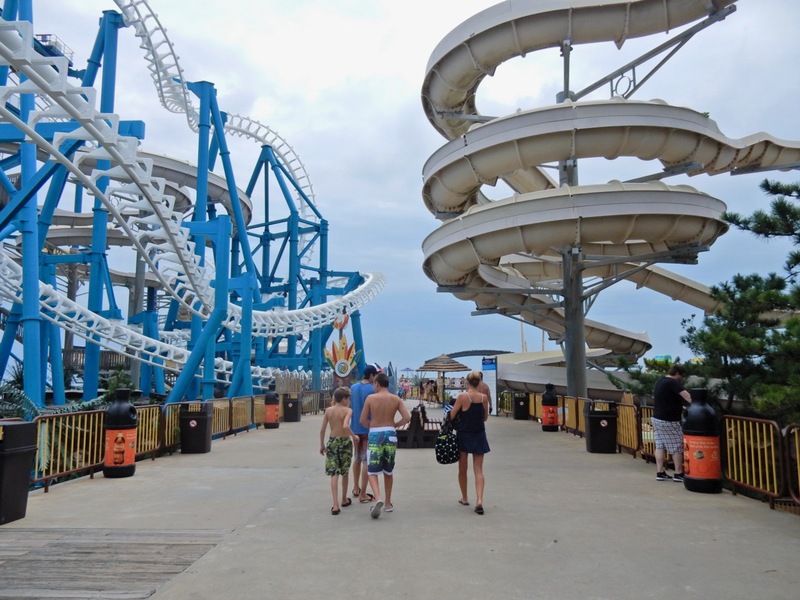 RIDES: Morey’s Piers and Beachfront Waterparks. 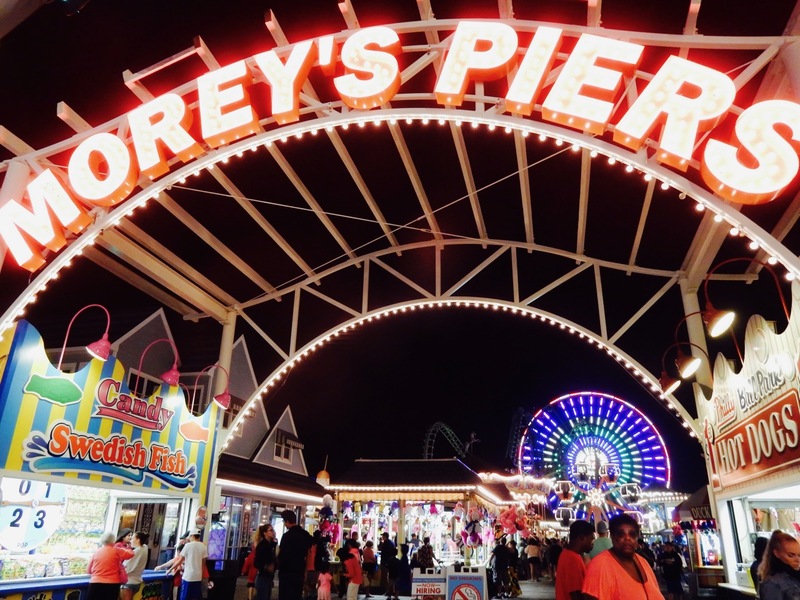 There are more amusement park rides on three Morey’s Piers – Surfside Pier (at 25th), Mariner’s Pier (at Schellenger Ave.) and Adventure Pier (Spencer Ave.) – combined than in Disneyland. 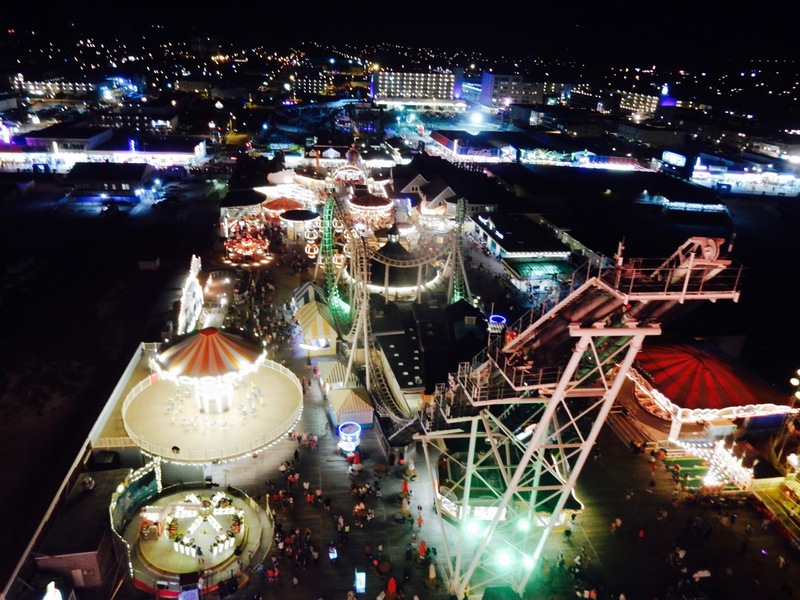 Two piers encompass water parks as well as the more traditional Ferris wheel and revolving rides. The third contains more extreme experiences, like the bungee Spring Shot and Screamin’ Swing. Repeat visitors often arrive with an Engineer’s time and motion study plan of attack to get the most out of several days. Water Parks generally open earlier than the Pier Rides, but check website calendar as opening and closing times change daily. $79 per person per day for water parks and rides. SWIM/GET WET/RENT: Cabana at Ocean Oasis Waterpark and Beach Club. 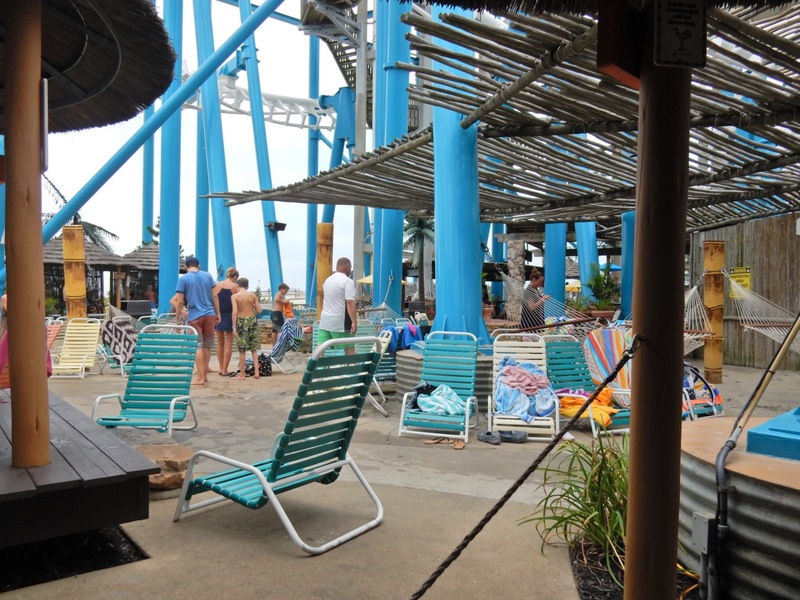 Although the brochure claims that these tiki-hut-like cabanas offer an “atmosphere of tranquility,” they are actually situated at the base of roller coaster stanchions, with all the clacking, rollicking, and exuberant screaming that implies. But, OK, drink service to your shaded chaise lounge is a huge plus, as is a private entrance/exit on the Endless River, so you don’t have to fight crowds. Rentals are per day, and include towel service and preferred food and beverage service. Small cabana $115 plus tax fits 4, Family Platform $275 plus tax for 16-10 guests for full day; MUST BE ORDERED ONLINE 2 DAYS IN ADVANCE. SWIM: The Wildwoods Beaches. 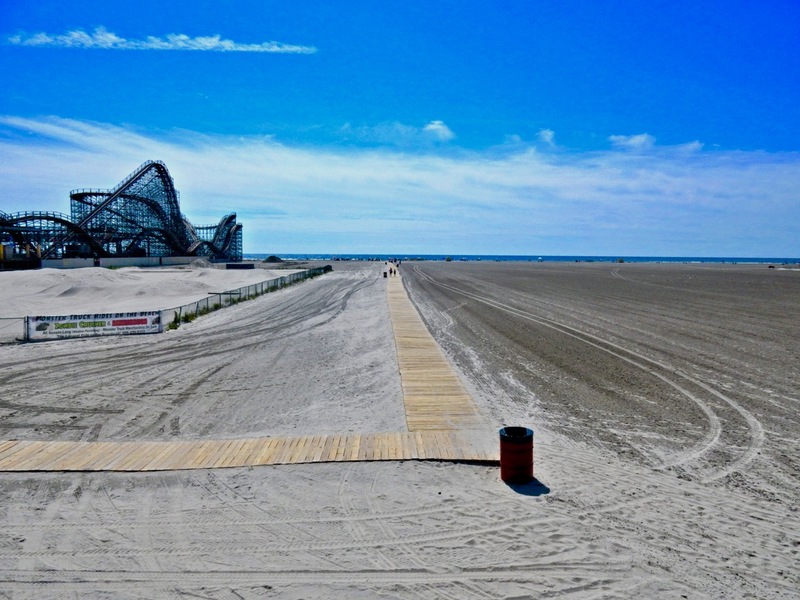 You might notice that it takes a long, long, long time to get to the lapping waves on Wildwoods’ beaches – in some cases, it’s ¾ mile from the boardwalk to the water. That’s because the “sugar sand” is swept here from points north (that includes North Wildwood), adding 30 feet per year to the width of shoreline. DOGS: Dog Beach. 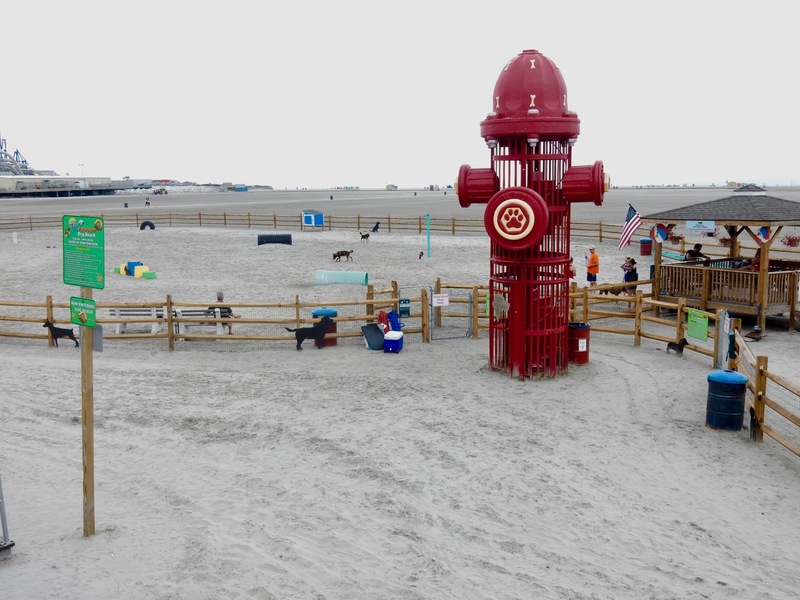 Yes, there’s a beach for your social pooch, and you can’t miss it. It’s the one between two Morey’s Piers with the big red fire hydrant! 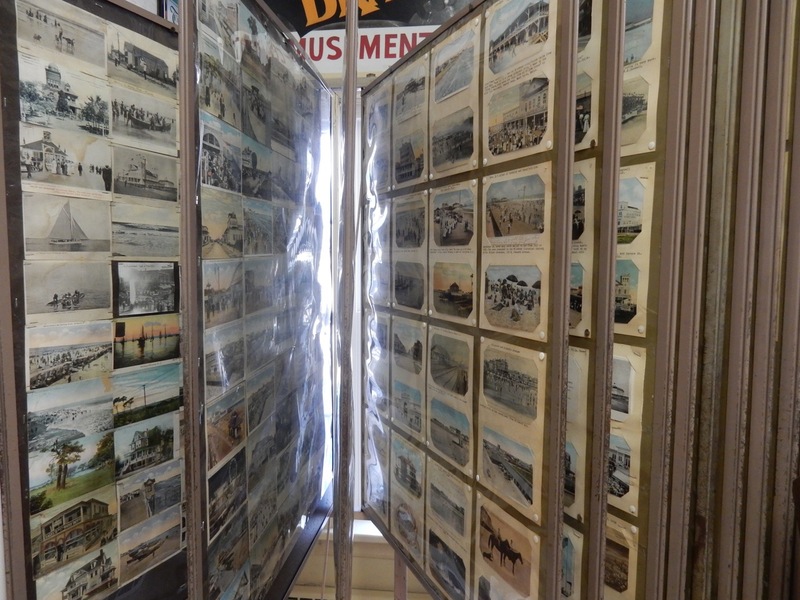 VISIT: George Boyer Historical Museum, Wildwood. This small but jam-packed museum should be one of the first stops, if only to get an overview of the island’s historical significance. First, sit down to watch the 45-minute long “Wildwood Days,” documentary that shows continuously in a room replete with artifacts. 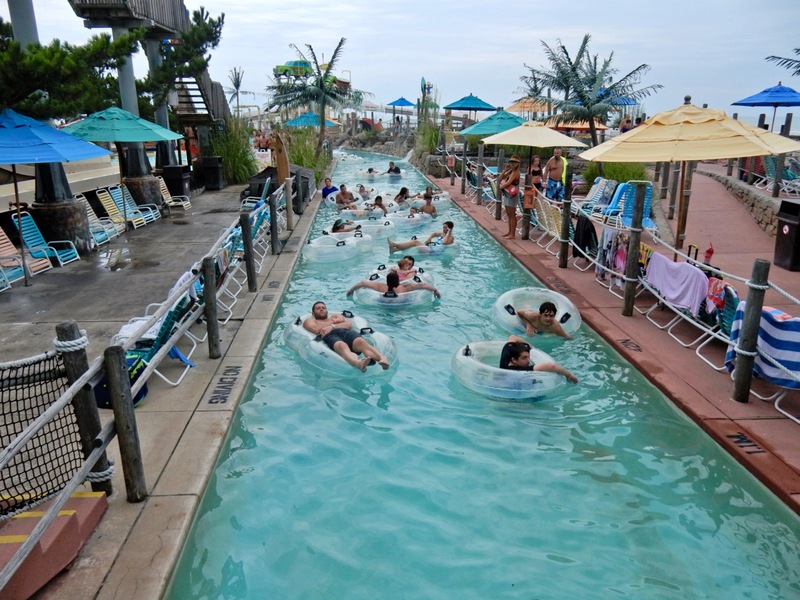 A resort since Native Americans set up fishing and clamming summer camps on this barrier island, the Wildwoods became popular in the late 1800’s when trains brought Philly day-trippers, who would eventually stay overnight at rooming houses. By the roaring 20’s it was all about bootlegged booze, and in the late 40’s, nightclubs were opening in droves for acts who wished to avoid the heat of Vegas in summertime. In the early 50’s the building of the Garden State Parkway was a boon to families who couldn’t afford to jet off to Florida, but could pull together funds for a family vacation at the beach and boardwalk. Many of these kids would dance the night away at the Starlight Ballroom, one of the largest nightclubs on the East Coast. Tony Bennett called Wildwood the “Real Birthplace of Rock and Roll,” because Bill Haley and the Comets premiered Rock Around the Clock here. Over three thousand teens at a time boogied to a new show called American Bandstand, Buddy Holly debuted That’ll Be the Day, and Chubby Checker (who still comes every year) spent his 19th birthday onstage at The Rainbow, demonstrating his brand new dance, The Twist. Dean Martin and Jerry Lewis, Louis Armstrong, Count Basie, Billy Holiday, Ella Fitzgerald, Sarah Vaughn, Fat’s Domino, Nat King Cole, and later Gladys Night and the Pips, Marvin Gaye, the Four Tops, Elton John, The Fifth Dimension, Neil Diamond, the Bee Gees, Yes, and Jethro Tull all played here. In the 1950’s, large luxury hotels were replaced by an abundance of Mom and Pop motels, some built by Wilbert and Bill Morey, aimed at less affluent families, with space-age and tropical names like Waikiki, Hawaiian, Caribbean, Singapore, Port Royal, Fantasy, Attaché, American Safari, Sputnik, and Satellite, playing off the monikers of fancy-pants resorts in Florida and Las Vegas. 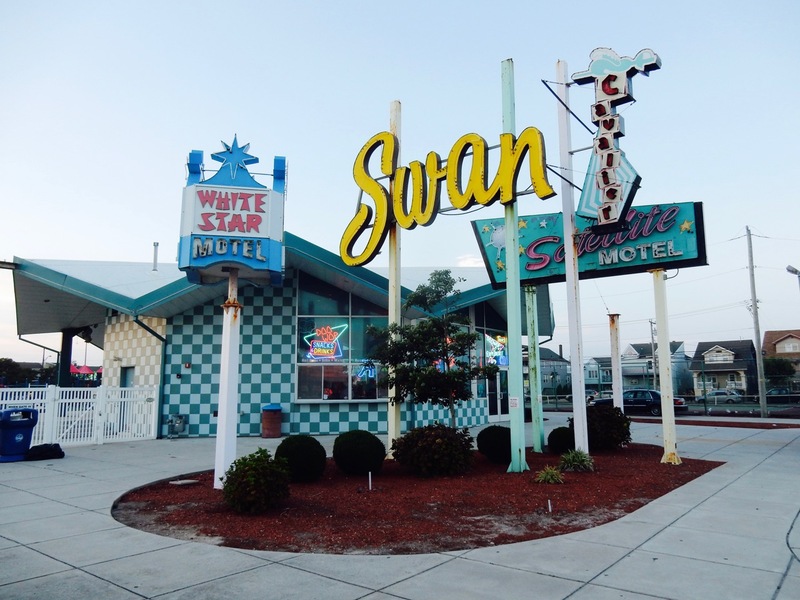 Sporting “Jetsonian” facades, plastic palm tree shaded pools, and quick access to the boardwalk, these lodgings and Wildwood itself became a magnet for the masses. By the late 1960’s Wilbert and Bill Morey turned their attention to the flagging Boardwalk. They saw a giant slide in a parking lot in Florida, bought it, and in 1969, installed it as a “carnival ride” on one of the piers. 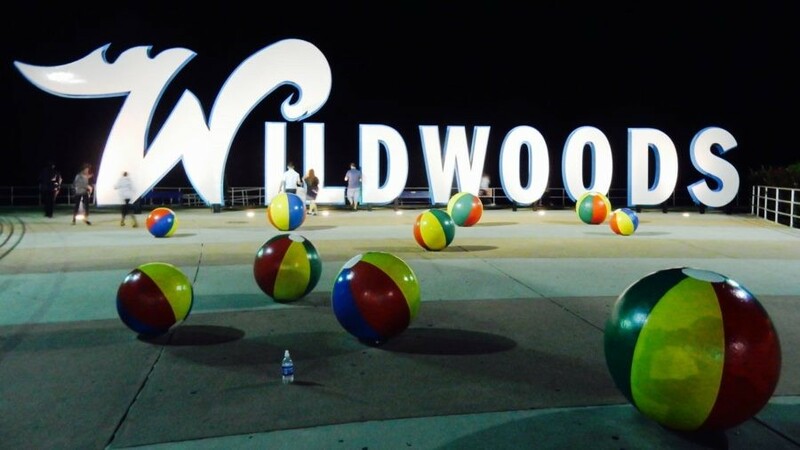 Now, Wildwood has one of the largest Amusement Parks (on three separate piers) in the country. History Museum Open May 15-Sept. 30, Mon-Sat, 9-2pm. Brothers, Wilbert and Bill Morey, founders of Morey Piers Amusement Park, started out building kitschy motels in the 1950’s modeled on those they saw in Florida, with swooping rooflines and kidney-shaped pools. By the late 1990’s, many of these so-called “Doo Wop” style motels were being torn down to make room for condos, inspiring a group of local preservationists to salvage what they could and inspire others to renovate. 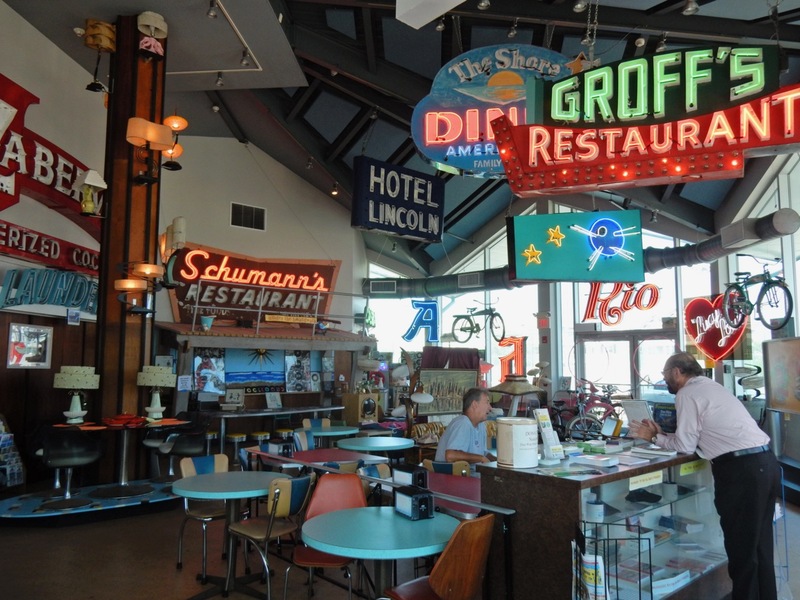 Many signs from these demolished icons have found a new home in this small museum, where you’ll also find interactive exhibits about the Wildwood’s heady days. TOUR: Doo Wop Back to the 50’s Neon Night Tour, leaving from Doo Wop Museum. Jump on the yellow school bus for a fun, hour-long narrated, luminous, and musical trip “Back to the 50’s.” You’ll see saw-tooth rooflines, “Blast-Off” architecture, the outstretched winged roof of the Sea Gull Hotel, and lots and lots of boldly colored neon motel and hotel signs lit up like Miami Beach shrunk down to Lilliputian size. Tues and Thurs in summer 8pm-9pm, $13 adults, $7 kids. TOUR: Hereford Inlet Lighthouse, North Wildwood. Built in 1874, this Victorian style light and keeper’s house at the northernmost point of the island (called North Wildwood or Anglesea) was the first permanently occupied building in the Wildwoods and is a still an active lighthouse and museum. The area’s strong currents and ever shifting sandbars resulted in many shipwrecks and groundings, necessitating a lighthouse to mark the mouth of the inlet. The Victorian-Carpenter-Gothic ornate lighthouse had to also serve as a comfortable home for a family in what was still a remote barrier island. It offered the island’s first Church Services, as the devout Baptist lighthouse keeper, Freeling Hewitt, would have had to row five miles to the mainland otherwise. In 1964, neglected and falling apart, the Hereford Inlet Lighthouse was decommissioned. Local conservationists sprung into action, saving and renovating the building, which was subsequently placed on the National Register of Historic Places and, in 1986 re-instated by the US Coast Guard. In 1998, Historic Preservationists began an authentic restoration of the lighthouse, which was completed in 2011. A self-guided tour brings you through comfortable rooms and up four floors for panoramic views of the area. 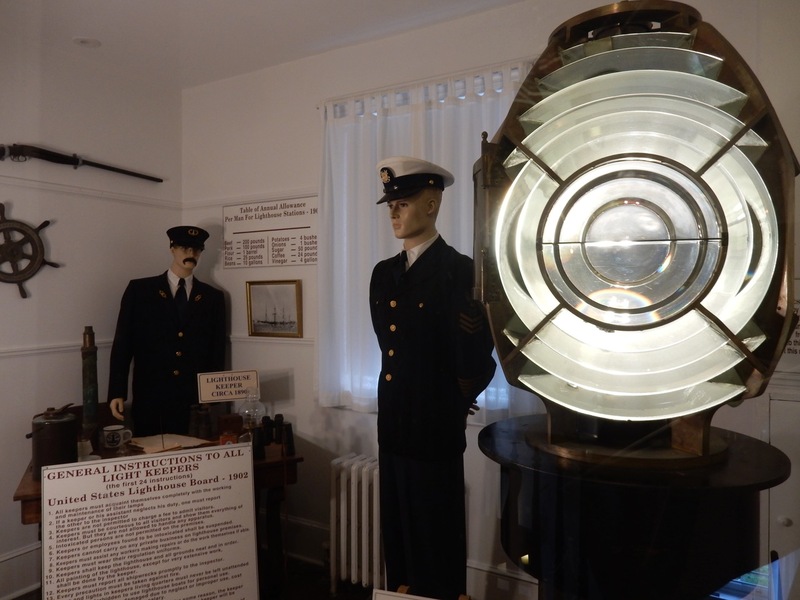 There are artifacts pertaining to the light and home – including the 4th order Fresnel lens that guided mariners safely through the inlet. 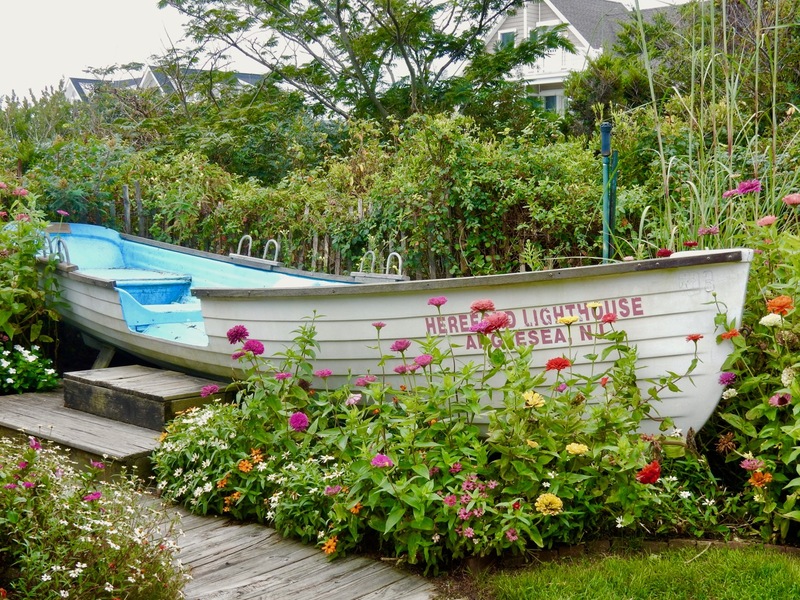 The lighthouse gardens are worth visiting on their own. 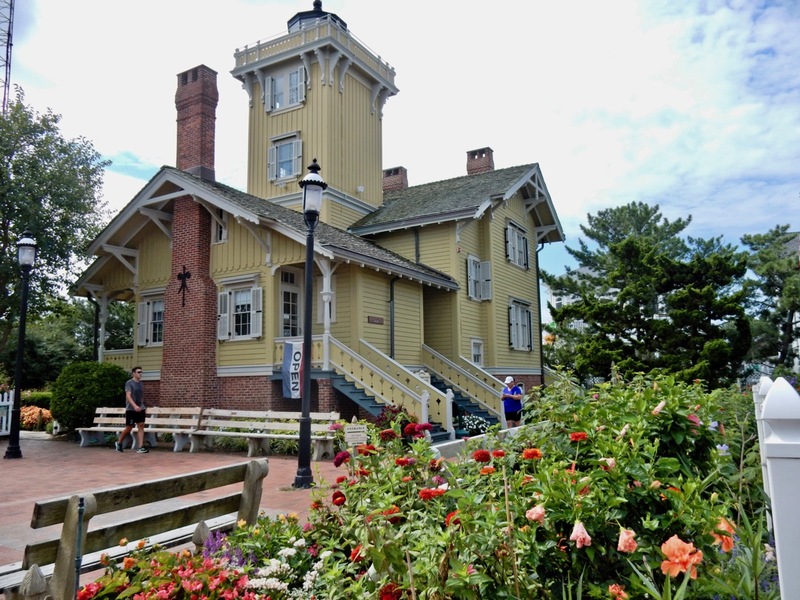 Designed, planted, and maintained by Steve Murray, a self-taught historian and author who served as North Wildwood Parks Supervisor, the property is a fantasia of blooms and colors. Open May – Oct daily 9-5, last admission 4pm, $6 adults, $3 kids. WALK: 1 ½ mile Seawall Trail, North Wildwood. 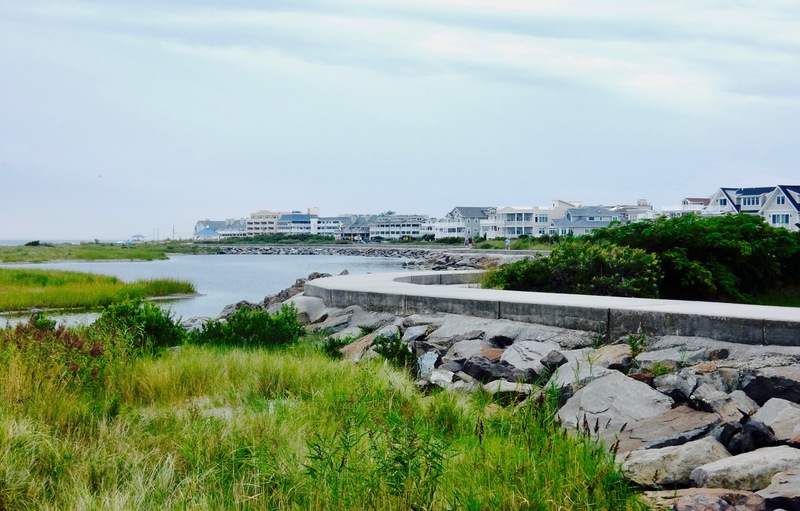 A lovely way to spend time near the crashing shore in calm weather – this concrete walkway is the latest way to get your water view-workout fix. CRUISE: Central Ave., North Wildwood. Henry Ford used to race his first car models on Central Ave. right here in North Wildwood. 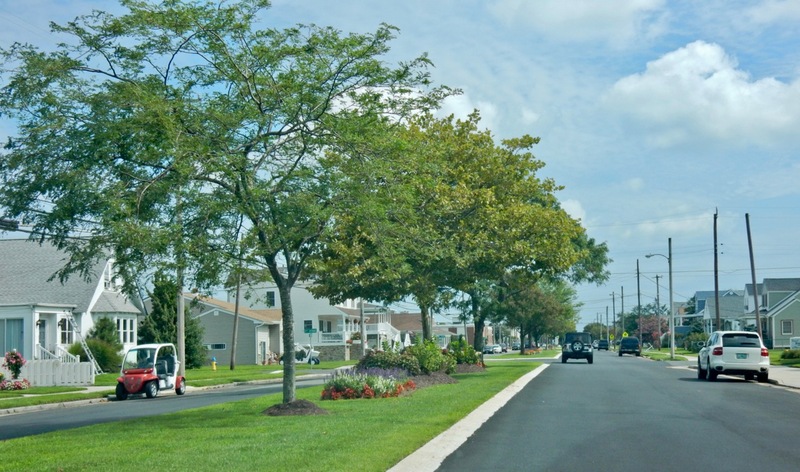 Now, it’s a lovely landscaped residential neighborhood worth slowing down for. 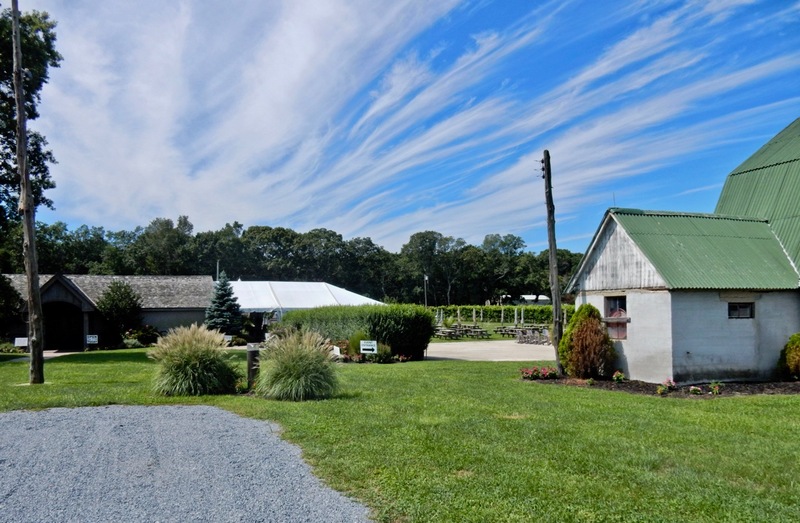 TASTE/WINE: Hawk Haven Vineyard,Rio Grande NJ. Just a few minutes from the Garden State Parkway exit (8 miles from the beach), Hawk Haven is known for its chardonnays, cab savs, syrah, dry rose and more. Formerly a vegetable farm source for nearby Dole, Hawk Haven was reinvented as a vineyard when Dole shut its local operations. Try Naked Chardonnay, Flying Press White, and others while listening to live music or attending other events such as Sangria Sundays. $8 for 8 1oz pours; 4 whites, 4 reds. GO: Cape May County Zoo, Cape May Courthouse. Plan at least an hour or more at this surprisingly satisfying zoo, which is undergoing construction, improvements, and expansion. 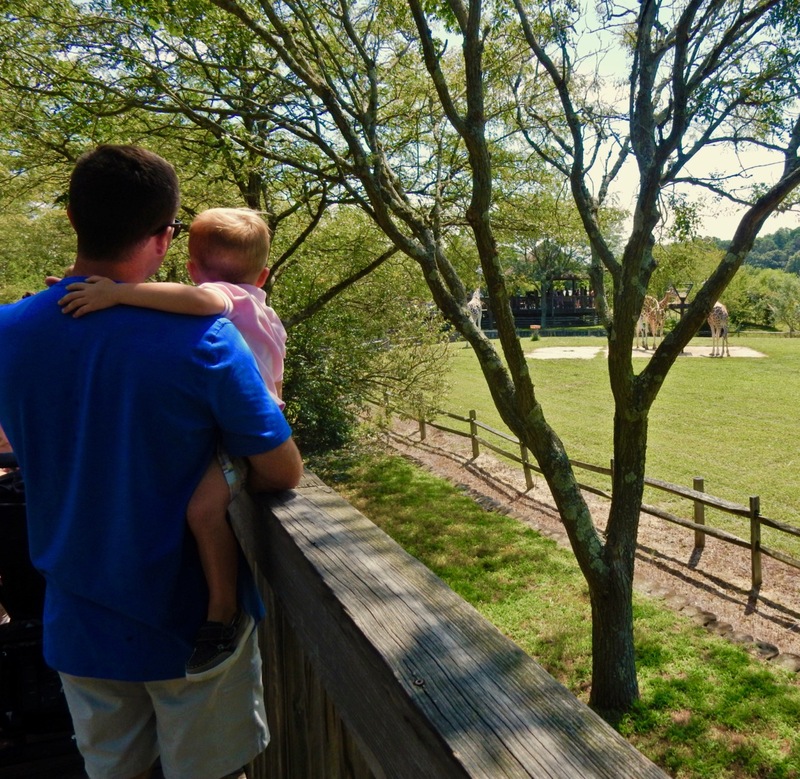 The most well designed open space enclosures are in the Asia/Africas/Americas “Pathway to Diversity” section, where you’ll find gamboling giraffes, and the zoo’s adorable Red Panda. Best of all, this zoo is free to enter and open every day 10-4:30 (3:30 in winter) except Christmas Day. EAT: Joey M’s La Piazza Cucina. One of Wildwood’s last Supper Clubs, Joey M’s is also one of the best Italian spots for foodies intent on finding that Philly chef who dreams about and then creates every dressing, sauce and glaze from scratch, and is so passionate about his craft, his descriptions alone will get you drooling. 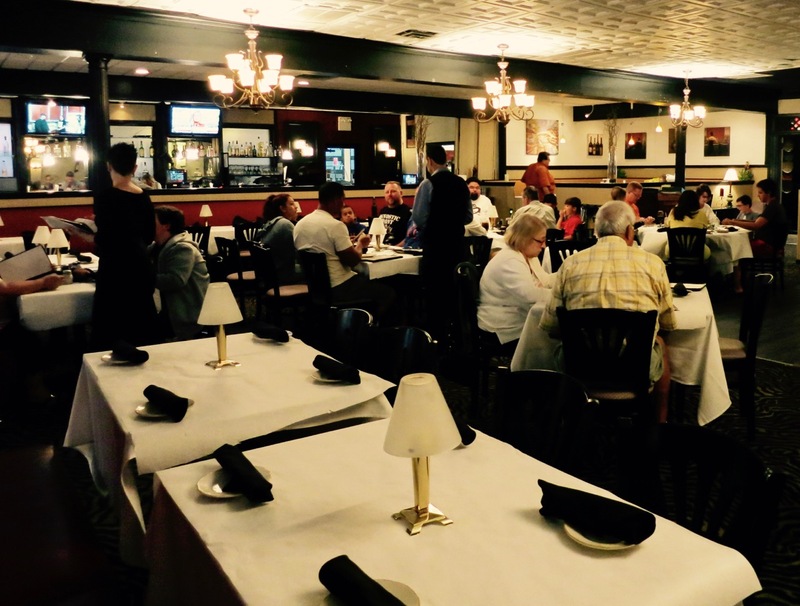 Joey Montello opened in Wildwood in 1999 after running Joey M’s Pub in Philadelphia for 25 years and counts among his customers Frankie Avalon, Bobby Rydell, and other Jersey Boys who are still going strong. Joey also croons as well, joining in with the bands on weekends. But his real talent is in the kitchen, coming up with hits like Sicilian Calamari coated with his “special sauce” – an amalgam of capers, black olives and hot cherry peppers; and the Tower Of Sin – a totem-pole of fried Tomatoes, Roasted Peppers, fresh Mozzarella, and Prosciutto. OMG incredible. EAT: There are 300 food outlets on the Wildwoods boardwalk, more than in the Mall of America. “It’s like being at a carnival all the time,” says one fan. 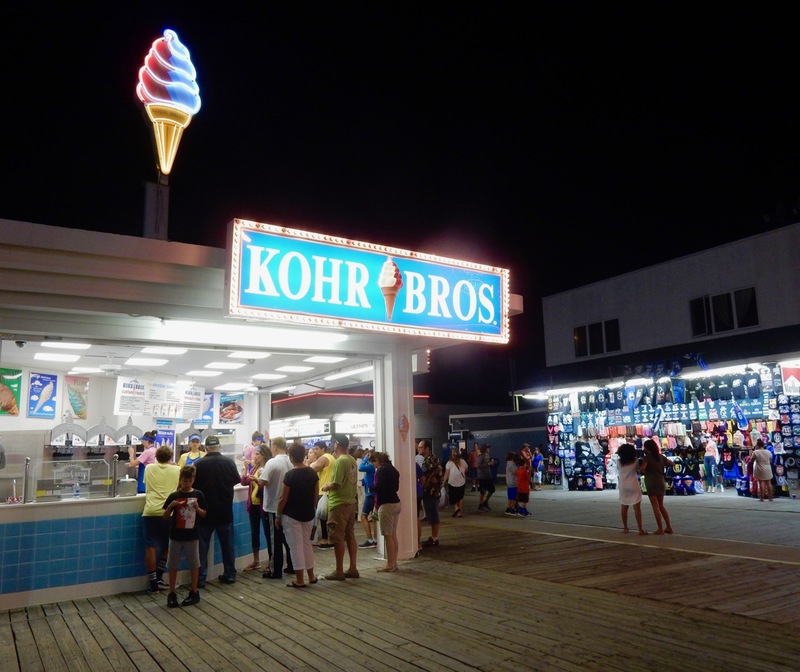 Most popular: Kohr Bros. Frozen Custard, Mack’s Pizza, and Curley’s Fries. 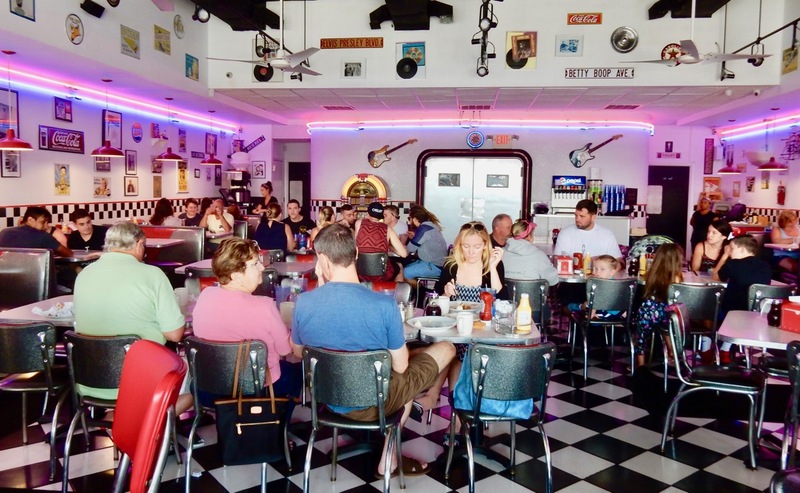 EAT/BREAKFAST: Doo Wop Diner, Boardwalk, Wildwood. Slide into a booth at the only sit-down restaurant right on the boardwalk. 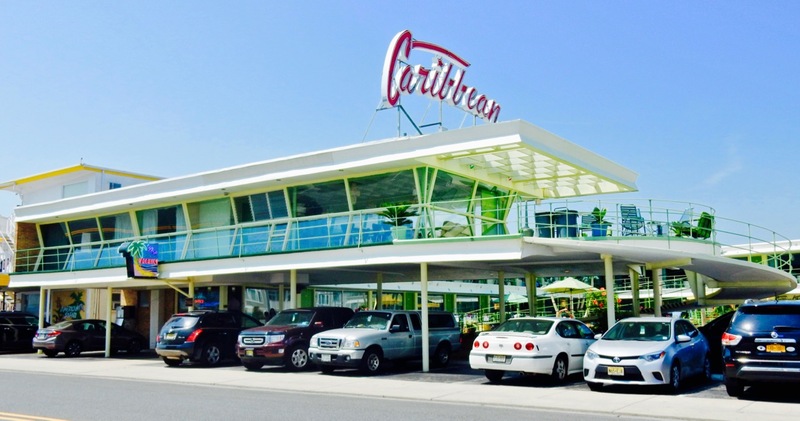 Owner George Karavangelos grew up in Wildwood as a “Boardwalk Brat,” and wanted to bring some doo-wop style and class to the Wildwood Boardwalk. 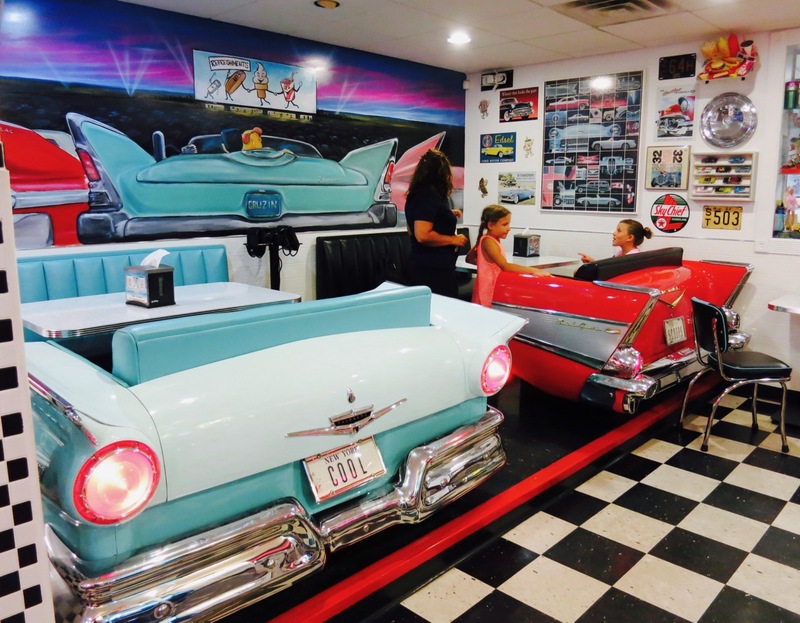 Now, his diner-like restaurant stands out from the rest for its clean 50’s themed dining room where a game room once stood. Food is good, freshly made, and fast – the likes of M&M, Blueberry Hill, and Oero Pancakes, sandwiches, salads, and fried foods. Nice thing is, you don’t have to stand at a counter to eat. EAT: Beach Creek Oyster Bar and Grill. 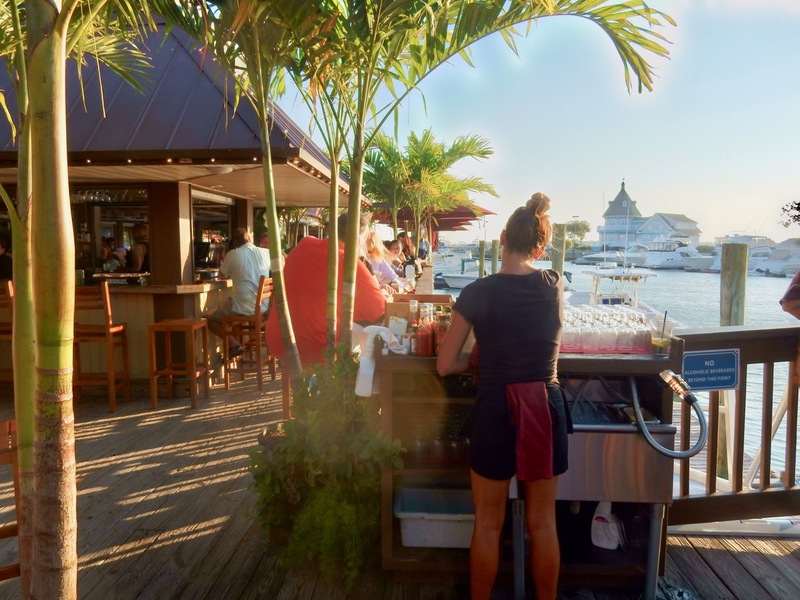 There can be upwards of a 30 minute wait at this hot clubby chop-house style restaurant – right on the waterfront at Schooner Landing, with marina and bay views. Come for the “First Seating” – which sounds better than the “Early Bird Special” but is basically the same thing. For $25 from 4-6, you get a 3-course meal, which includes excellent fresh-baked bread with fresh bruchetta. Heavy on steaks and chops ($35-$48), fish ($20’s to $30’s) and lobster tails ($50), you’ll also find Chicken Rosa simmered in Rose wine, and Strawberry BBQ Salmon – a signature. EAT/BREAKFAST: Uncle Bill’s Pancake House. 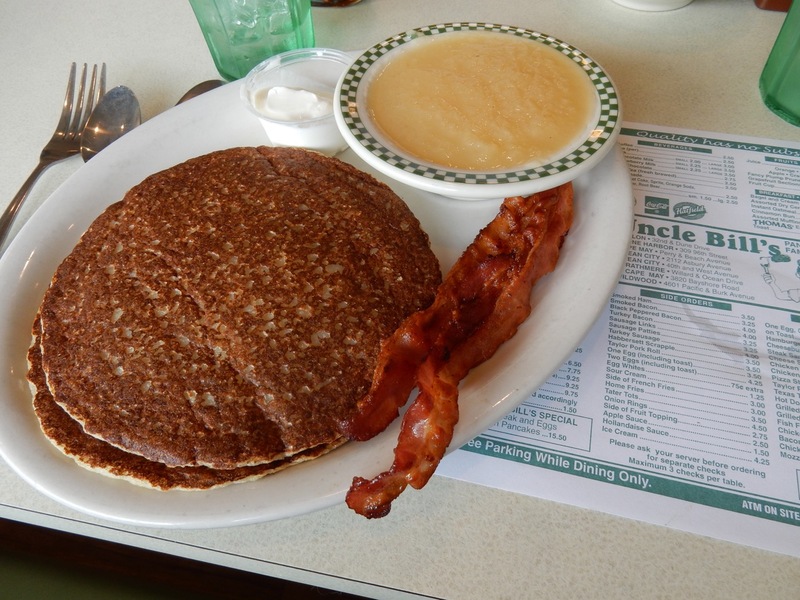 One of 8 Uncle Bill’s on the shore, you’ll find any kind of pancake here – today’s special, Almond Chocolate Chip. Run by its 2nd and 3rd generation, each of 8 Uncle Bill’s locations is owned by factions of the 60 or so family members who come up with ideas and engage in “friendly family competition.” It’s like a hometown indie International Pancake House, but better, with all types of yummy versions: Potato, Apple, Peach, Strawberry, Blueberry, and “yeasty old fashioned buckwheat.” $7.75-$10.25. ICE CREAM: Cool Scoops. 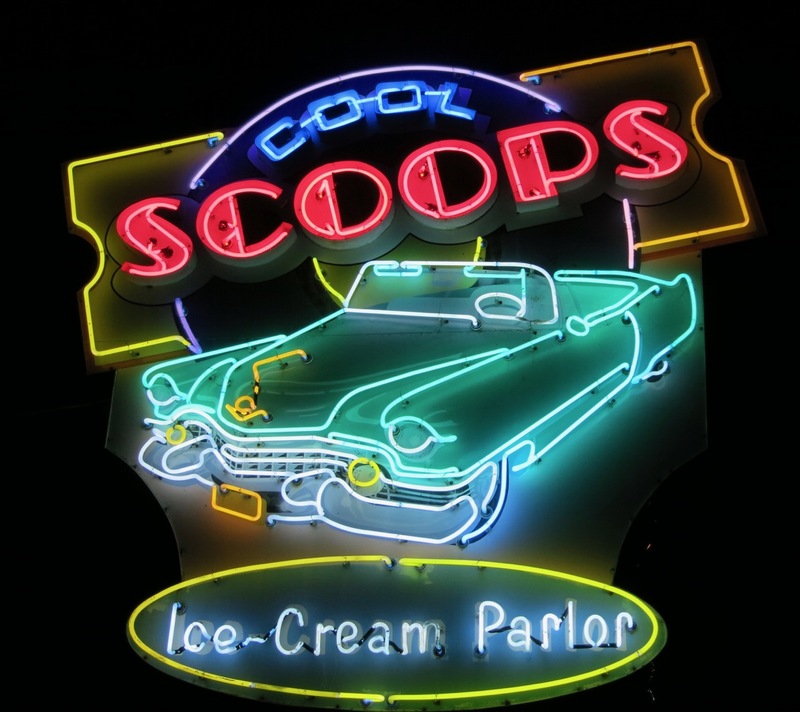 Sit in a Chevy, or at the counter of a 50’s soda shop at this “cool” funky ice-cream shop plastered with photos of 50’s icons. 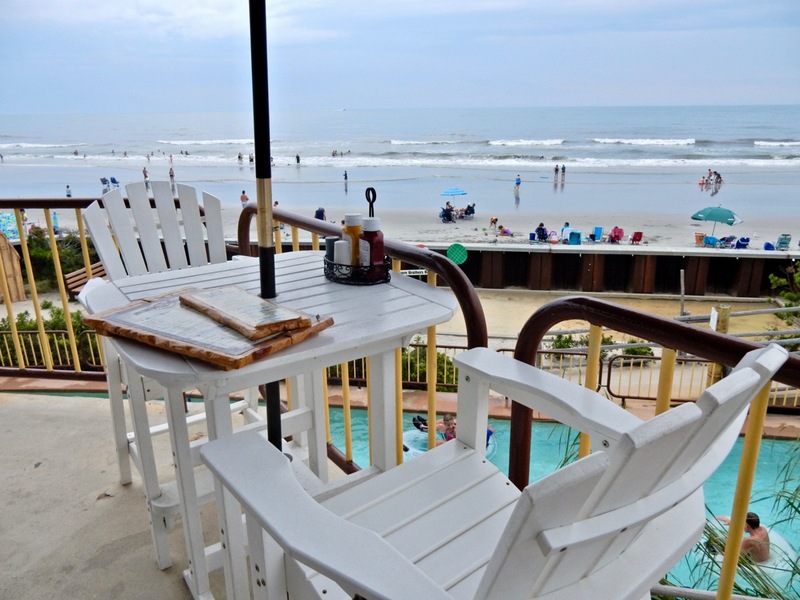 STAY: Starlux Hotel, Wildwood. In 2000, the Morey brothers renovated the old Wingate – turning the faded Wildwood icon into a retro-chic starburst of a lodging. Proving that a hotel doesn’t have to be 5-star to be special, The Starlux is not “luxurious” in the private-butler lavish sense, but is a portal back to a simpler time, with witty, sweet, and immaculate rooms, a cool style that harks back to the Mad-Men 60’s, and a warm and welcoming family friendly vibe. This boutique hotel is such a Maven Favorite – it’s got its own featured page HERE. The plastic palm tree ringed crescent pool glistens once again, just as it did when it first opened in 1957. 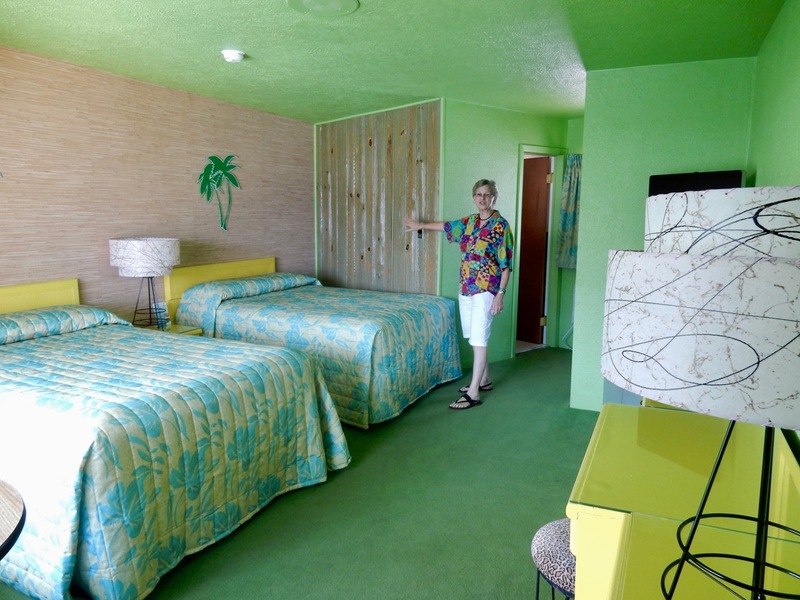 Rooms have been completely redecorated with radio dials and speakers embedded in “Lime Rickey” green walls, re-stained original wood paneling, and upscale furnishings, like reproduced George Nelson Marshmallow chairs. 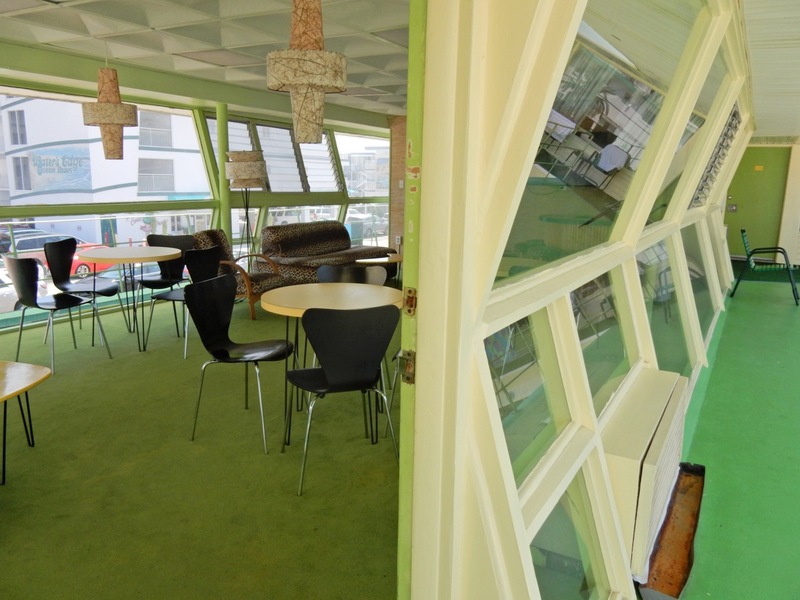 Watch the sunrise over the ocean from the upper sundeck lounge, enclosed within walls of lean in-lean-out windows, sporting authentic animal-print Brentwood furniture. The Caribbean is now listed on the National Register of Historic Places, is a member of the prestigious Historic Hotels of America, and has been touted in the Washington Post, the International NY Times, and other national and international publications. Rates $84-$274 per night depending on season and size of room. STAY: Summer Nights B&B. Each guest room in this handsome home has a 50’s or 60’s music or theme. The owner greets visitors wearing a poodle skirt, and in the afternoon serves ice-cream floats. From all accounts, a wonderful and unique B&B. Rates from $115-$290 depending on size of room and season.